Scanning the skies at the Department of Skateboarding, we came across this YFO (yet-to-be-identified flying object.) That is one huge kick-flip out of the radar dish during this year’s St. Valentines Day Massacre. 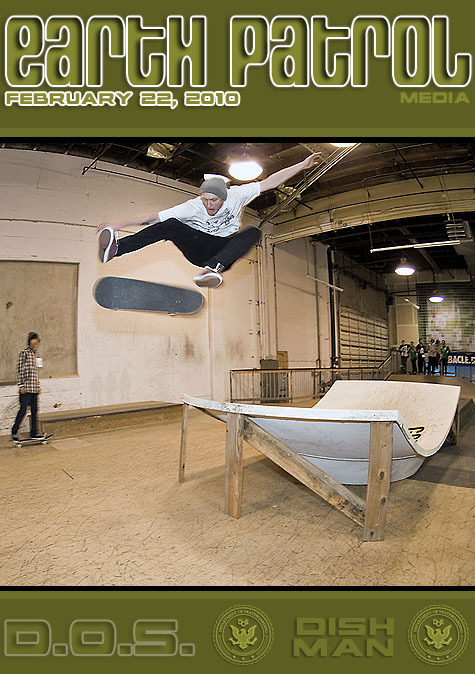 Help us identify this week’s Monday Cover skater, a.k.a. Dish Man, before the men in black knock on our door. Check out more YFO pics after the turn. This is my buddy Cam! I’m not sure of his last name. I met him at the Bellingham skatepark, and now he lives down in Portland. That satellite dish is now being utilized as part of a cradle at the Epic bowl. nice ninja kick! I didnt even notice a skateboard under him. party on wayne. I just recently got to go to Dept. of Skateboarding while on a trip out there. I wasn’t even planning on going, with the huge selection of concrete parks around there, but that really is a fun park. Glad I checked it out!